A presentation from Rheinmetall's Capital Markets Day 2015, an outlook for the investors held in November last year, includes a few very interesting informations about the future of Rheinmetall Defence. Rheinmetall is developing an upgraded 120 mm high-pressure gun and a new 130 mm gun. 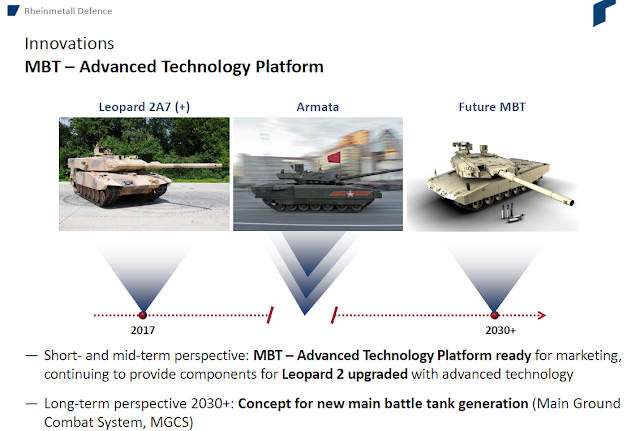 The modernization of the Leopard 2 suggested by Rheinmetall is pretty much identical with the MBT Technologieträger and it's new technologies. An interesting standout feature here is however the "new 120 high-pressure cannon and ammunition", which will offer a 20% increase in performance. This leaves a lot of room for speculations: One possibility could be that the "new" gun is refering to the already existing 120 mm L55 gun and this statement is related to the 103 Leopard 2A4 tanks, which were bough back from the German industry by the German Army in 2015. These tanks will be upgraded in the near future to work together with the 225 Leopard 2 MBTs currently in service, which are all in the 2A6, 2A6M or 2A7 configuration. It is known from data provided by Rheinmetall, that the L55 gun provides 15% higher muzzle energy than the shorter L44 when firing the DM53 ammunition; the 20% could be the result of a new type of main gun ammunition (then designated DM73), which has been confirmed to be in development in 2015. Another possibility is an increase in barrel length, mentioned by Autobild.de, the first source to mention the 130 mm gun. Autobild.de is not a military related source, but they were invited to a presentation of the MBT Technologieträger prototype. According to them, an increase of 1 meter in barrel length is a possibility (but my original interpretation of their words was that they talked about switiching the Leopard 2 Revolution prototype from L44 to L55 gun). If this makes sense, given the drawbacks affiliated with a longer gun barrel, is questionable in my opinion. A third option would be upgrading the L55 gun, but only by using more modern components instead of lengthening the barrel. As the barrel has to be replaced on a regular base (due to barrel wear), a cheap option would be the replacement of the gun barrel with a more modern one, which due to better manufacturing processes (such as a higher pressure for autofrettaging) and/or better metallugry can deal with higher pressure ammunition. This has been done in the past at least by the US and probably also by some Leopard 2 users. The development of the 130 mm gun is quite a surprise. When originally mentioned by Autobild.de, I assumed they had made a typo and refered to the original 140 mm NPzK tank gun being developed in the late-1980s and 1990s. Given Rheinmetall's plans to upgun the Leopard 2 with the 130 mm gun and the smaller calibre, it seems reasonable to assume that the new gun is physically smaller than the 140 mm NPzK tank gun, which proved to be too large for the original Leopard 2 turret (also due to requiring an autoloader). 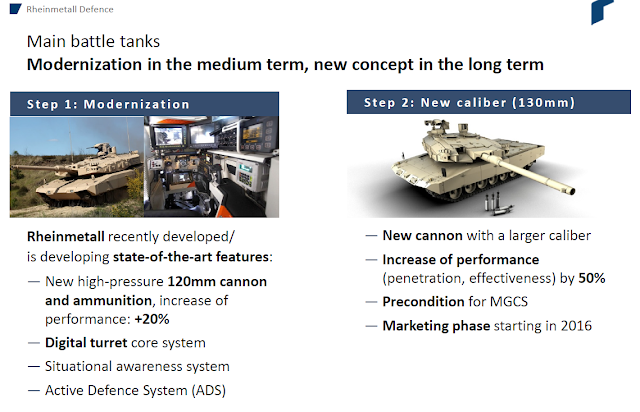 However it seems that the new gun will provide similar or even better performance than the canceled 140 mm gun: Given that a current DM53 APFSDS has an energy output of nearly 13 MJ according to Rheinmetall (or 0.2 - 0.3 MJ less according to calculations based on muzzle velocity and weight), the 130 mm gun (which according to the presentation provides 1.5 times as much performance), should provide a muzzle energy about 19.5 MJ at least - if the 1.5 times more performance is meant in relation to the "new 120 high-pressure cannon and ammunition", which already provides 20% more power than the current 120 mm gun/ammo - then a muzzle energy of 23.4 MJ could be reached! Just for reference, the 140 mm gun supposedly had a muzzle energy of about 20 MJ. How exactly the new gun will achieve such a big performance leap is unkown; making the ammunition larger without opting for an autoloader or two-piece ammunition is not possible. Using two-piece ammunition could enable the Leopard 2 to retain it's crew of four, as done on the Swiss prototype with RUAG 140 mm gun, which was manually loaded. Rheinmetall has at least confirmed that the new gun will be marketed beginning in 2016, so we might see a few further posts about this topic in this year. A possibility for both tank guns mentioned by Rheinmetall is also the use of new technologies, such as an ETC gun. Already in the year 2000 an ETC gun prototype managed to outperform a L55 tank gun using a projectile of the same weight. This was published in the European Forum on Ballistics of Projectiles, article "Status and Results of the German R&D Program on ETC Technologies". The LKE II (DM53 prototype) fired from the L55 gun reached a muzzle velocity of 1750 meters per second (mps) at 21° centigrade, whereas a projectile with the same mass, fired from the ETC prototype gun with 110 KJ of electrical energy added, managed to reach a muzzle velocity of 1822 mps and an energy output of 14 MJ. The new 130 mm gun is a precondition for the Main Ground Combat System (MGCS). The Main Ground Combat System is currently being developed by Germany and France as replacement for the Leopard 2 and Leclerc main battle tanks, although Rheinmetall is expected other nations to join into the MGCS development. 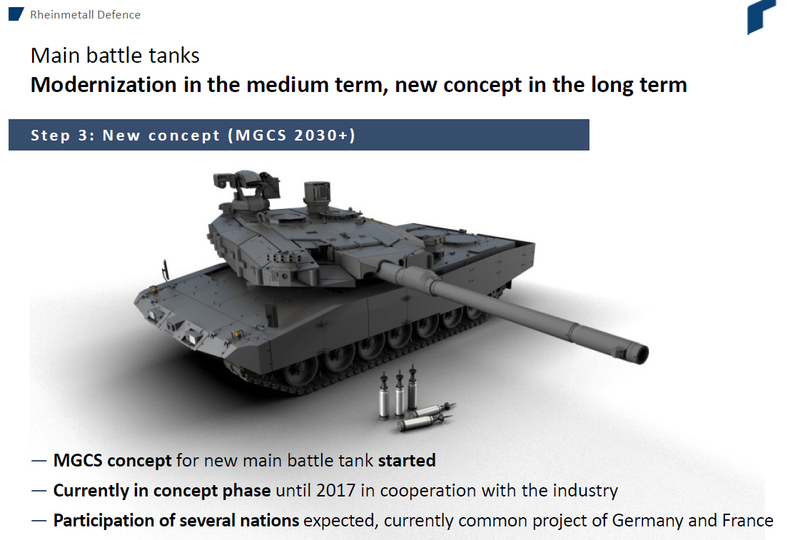 The contract between Germany and France for the development of the MGCS was signed originally in 2012, despite becoming only wider known after the new Russian T-14 Armata MBT was revealed in May of 2015. It is understood that the MGCS is currently in the conception phase; different concepts are being made and evaluated, while new technology is being researched and tested. The conception phase is expected to last at least until 2017. Regarding the 140mm weapon system, you need to have in mind, that the development was ~20 years ago, with technology that was available at that time. No one knows if they could exceed the performance from the 80/90s with todays technology, materials etc. compared to the new 130mm which as you assume, could have a similar performance as the old 140mm cannon project. I think the main reason on why they picked the 130mm, is that they still could use a manual loading system, which is or was required by the german BAAINBw / BW . надо просто " срезать " нарезы у английской пушки танка " Челлленджер "